Basically an outfit of all my favorite “no-brainer” items at the moment. These Ray-Ban sunglasses have quickly taken the place of my Marc by Marc Jacobs pair as my preferred cat eye. I have a small face so finding an exaggerated sunglass shape that doesn’t make my head look like that of a small child’s is always a challenge. These babies fit the bill. And with that great thought, I am mentally checking out for the weekend. Hope you all enjoy yours! PS I’m (finally) Instagrammin’. 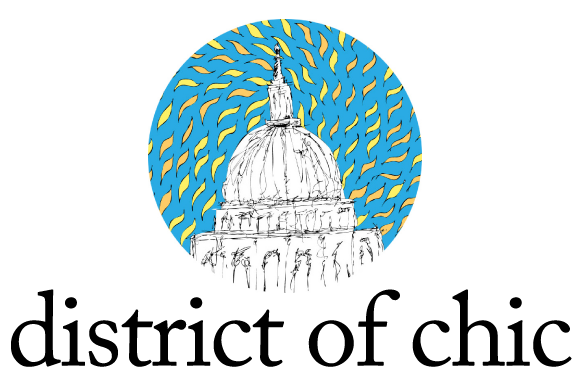 Find me at @districtofchic. That lace blouse is so lovely. Love this look – especially those long cozy sleeves! Sounds good! Enjoy your weekend! This lace blouse is just lovely on you! the top is sooo cozy and i can't help staring at your perfect legs! Love the bell shape sleeves! so cute. Oh, those bell sleeves. Swoon. That is such a beautiful top! So pretty. Your lace blouse is so pretty and romantic. I love the classic black pieces you paired with it. Happy weekend! the lace sweater is lovely in you…happy weekend! I love the detailing on that jumper; so sweet! 🙂 It fits you perfectly. Very Classic! I love your shoes! Such a pretty, simple outfit, I love your beautiful lace top and then the detailing of your shoes. I love the simple yet chic colors of this outfit. It's parisian but hippy chic. You look gorgeous! That blouse is stunning. I like the simplicity of this look, and I love how feminine it is. The lace blouse look so pretty. Love the look. What a pretty sweater! Is it made of lace or it's the knitting pattern? Love this outfit, so simple, casual and totally beautiful! Love the long blouse! It reminds me of Free People. It's so cute with the shorts and simple heels. Funky combination! I love the shorts (and how long they make your legs look)! I have the same problems with sunglasses but I recently got the Taylor Cat Eye sunglasses by Elizabeth and James and they are the perfect size. Hope you had a fabulous holiday weekend. definitely love the new sunnies, they are perfection. Love the lace tunic and shorts combination! I love the cat eye style on you!!! lovely lace outfit! it definitely welcome the easter weekend! Your glasses are fantastic! I tried the cat-eye but my head's too darn big, haha! That blouse is gorgeous! I love the scalloped edges. That is a really great thrift find. I love the blouse.